My Man Jeeves [Book Review] – my books. my life. 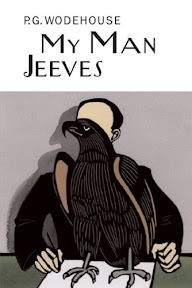 My Man Jeeves is a collection of 8 short stories. In four of them, we are once again with our good friend Bertie and, you guessed it, his man Jeeves. Bertie has been banished to New York City by his Aunt Agatha and is living the good life in America. But his knack for getting mixed-up in the problems of others follows him across the pond. The other four stories involve Reggie Pepper who I understand is an early prototype of Bertie Wooster. Reggie is just as good at getting caught up in his friends’ drama as Bertie but we are missing the Jeeves element from these stories. I enjoyed these stories but I’m glad Wodehouse got on with it and created Bertie and Jeeves for us. There isn’t much to say about this collection that hasn’t been said about any of the Jeeves’ books. They are delightful. They are hilarious. They should be read and enjoyed by all. That is all. Interesting review, Michelle! I haven’t read any of Wodehouse’s short stories. They look equally delightful, from your review! I loved the Fry/Laurie Jeeves & Wooster series on BBC but I’ve never actually read any of Woodhouse’s writing – definitely something to remedy in the coming year! Can’t go wrong with Wodehouse! 🙂 I do prefer the Jeeves and Wooster books, but really, I love anything by Wodehouse. Will have to read these stories at some point, too. Delightful is a perfect word! I’ve read two Jeeves books and thoroughly enjoyed them. I really need to read another soon. They rarely make me laugh out loud, but they do make me smile and snicker to myself while reading them. You know how much I love P.G.Wodehouse but somehow I’ve managed not to read any of his short stories yet. Can’t imaging anything better than the Jeeves and Wooster novels but I’m sure all his works share the same wit and incredible writing. Looking forward to reading this one! I’ve read most of the Jeeves books and I love them all. I have yet to have one fail to make me laugh out loud.